This Study entitled “the study of the aetiological factors of failures of myringoplasty” was planned to find the various aetiological factors causing failure of myringoplasty and suggests remedial steps to improve the results in future. 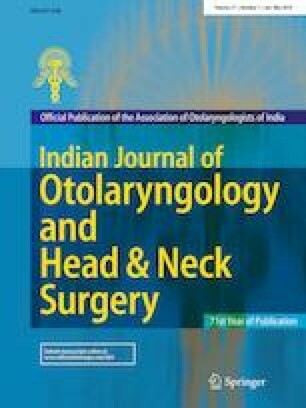 This observational study was carried in the Department of E.N.T, on patients who had undergone myringoplasty from Jan 2013 to June 2016. Total 905 patients operated in the above mentioned duration. 685 patients were operated during Jan 2013 to June 2015, who were studied retrospectively (only 540 came for follow up), and 220 patients were operated during June 2015 to June 2016 were studied prospectively. The patients who came to the OPD for follow up, were thoroughly reviewed and the re-perforation was seen in 53 patients. Total nine factors causing myringoplasty failure were studied, 4 factors i.e. size of perforation, site of perforation, eustachian tube function, and surgeons experience significantly affects the surgical outcome of myringoplasty while age, tympanosclerotic patch, type of anaesthesia, wet or dry graft placement, and deviated nasal septum does not affects the myringoplasty failure. For improvement of result in future, Eustachian tube dysfunction, symptomatic deviated nasal septum should be corrected before the surgery. Anterior and larger perforation should be operated by experienced surgeon.